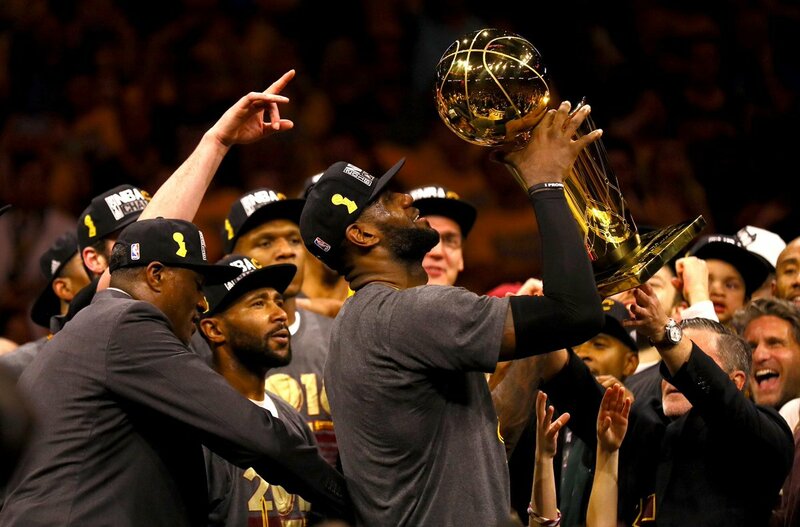 Cleveland Cavaliers triumphed over the Golden State Warriors in a thrilling conclusion to the NBA Finals, winning the first championship in their history. A gladiatorial performance by LeBron James was the highlight of a game 7 full of twists, turns, lead changes and blocks as the Cavaliers silenced the Oracle Arena with a late game winning three pointer by Kyrie Irving. Excitement reached fever pitch in Oakland with all hanging finely in the balance, one final game to determine history, an occasion where the stakes had never been higher. Cleveland won the tip to begin a first quarter that was finely matched with the visitors leading by just a point after 12 minutes of action on the court. There were plenty of positive signs for the Cavaliers early on, with Kevin Love crashing the rebounds while LeBron was ever reliable and more determined than ever in his quest to bring a championship back to the city, capping off his first quarter with a pair of free throws to differentiate the scorelines. 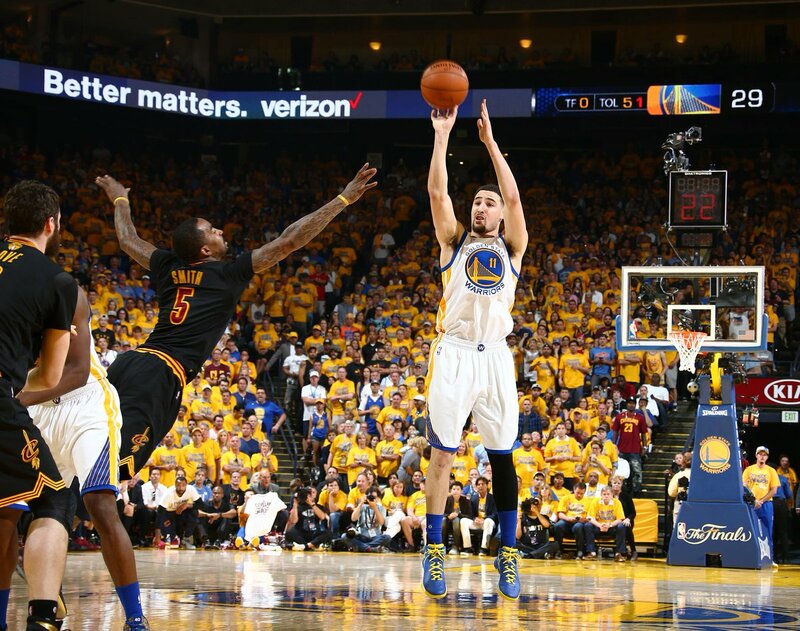 Unlike previous games in the series, game seven was an intensely close one. The leads were constantly changing while Warriors continued to drill three pointers, but clearly the Cavaliers - who may not have been excelling from beyond the perimeter - had other ways to make up the measures. Midway through the second quarter, Iman Shumpert nailed a four-point play after scoring Cleveland's first three-pointer of the game while getting fouled in the process. He converted the subsequent free throw before LeBron and Curry, the two big stars of the Finals, clashed when the latter picked up a second foul as James ran from the defensive end. LeBron would also get the upper hand in the next meeting between the two just a couple of minutes later. Similarly to how he denied Curry earlier in the series, a statement-making block with over 4 minutes left on the clock on a lay-up attempt pumped more enthusiasm into the away side. Barbosa would suffer the same fate later in the second quarter. At half-time, Warriors lead 49-42 with Draymond Green shining to boost confidence in California, although Cavaliers remained hot on their heels throughout the entirety of the first two quarters. It remained finely poised with just 24 minutes left to decide the fate of the NBA Championship. After an 8 point lead gave Golden State their biggest lead of the game so far, the Cavaliers burst back into the game thanks in part to a delightful lay-up in transition by Kyrie Irving, running straight round Green on the counter to put it in and help the Ohio contingent get back into the mix. It would be tied at 71 points with just under 2 minutes left of the third quarter, as Draymond Green's three and Livingston's dunk once again evened things up very nicely. Iguadola made good on a second attempt to put Warriors a point up going into the fourth quarter. With time quickly winding down, the lead changes continued, Curry and Thompson drilled from deep while LeBron viciously attacked the basket. It became a question of who would step up and take the championship home - it remained all to play for after a thrilling game. With 3 minutes and 40 seconds left of regulation, it was tied at 89 apiece. Iguadola then blocked LeBron before he got payback in emphatic fashion. Iguadola exchanged passes in transition to get a free run at the basket, but the "King" flew out of nowhere and smashed it against the backboard to keep it out, providing another late surge of momentum in favour of Cleveland. In the final minute, Kyrie Irving stepped up and nailed a spectacular three-point shot right over Steph Curry, dribbling it in and out before finding just about enough space to creep it in - a blow of which the Warriors would never recover from. They panicked and the necessary foul was committed by Green on LeBron, although leaving the Cavaliers star in a heap, down on the floor holding his wrist. He was able to continue, converting one of two free throws to put it out of reach - and when Curry missed a three pointer, the rest was dealt with, and the Cleveland Cavaliers won their first ever NBA championship in franchise history. 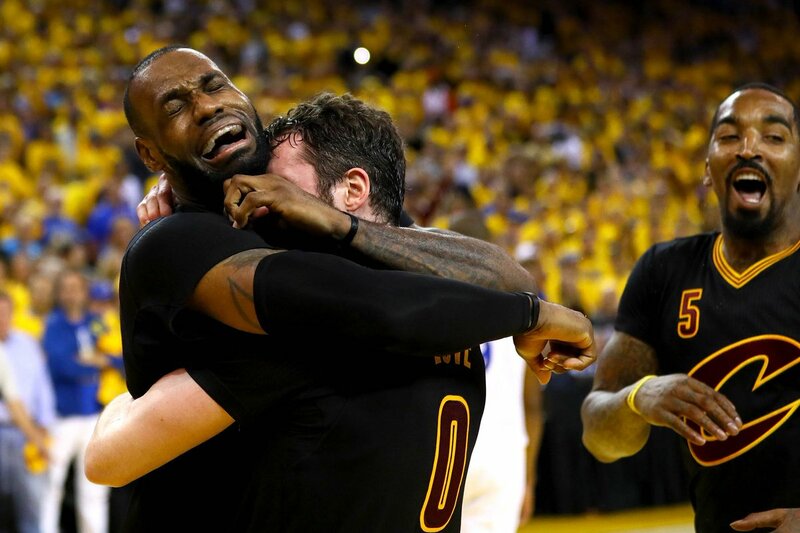 An emotional LeBron James sunk to the floor crying tears of joy, the Oracle Arena meanwhile was silent as the Warriors fell so short of finishing a record-breaking season with NBA gold. They did all but win the title - and that was due to a resilient effort from the Cavs, especially LeBron, who refused to stop. 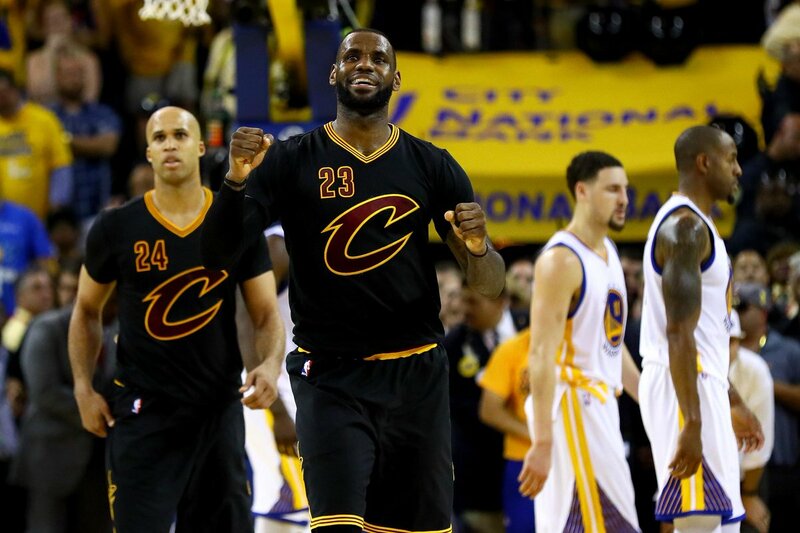 They became the first ever team to overcome a 3-1 deficit in the Finals. The Larry O'Brien Championship Trophy was presented by NBA commissioner Adam Silver along with LeBron winning the Finals' MVP award, both clutched gratefully by the Cavs' star as a dream was made a reality - a historic moment to end a historic game that will go down in the books.